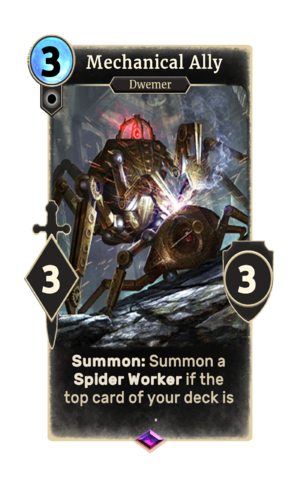 Summon: Summon a Spider Worker if the top card of your deck is . Mechanical Ally is an epic Neutral creature card. It is currently excluded from Arena mode. Mechanical Ally was the monthly card for the month of October 2016, during the open beta period. This page was last modified on 11 December 2018, at 00:35.